Samsung’s fabled flexible phone, rumored to be called Samsung Galaxy X, may have recently shown its first sign of movement. The device has been using the model number SM-G888 as it’s gone through the various regulatory steps needed to produce a compliant mobile device. The NRRA lists it as “radio equipment for LTE mobile communication” and when it was seen at the Wi-Fi Alliance it was described as a “Smartphone”. While it’s possible the Sm-G888 is another phone entirely, it doesn’t fit with anything in the current ranges. The idea of a foldable phone is nothing new. 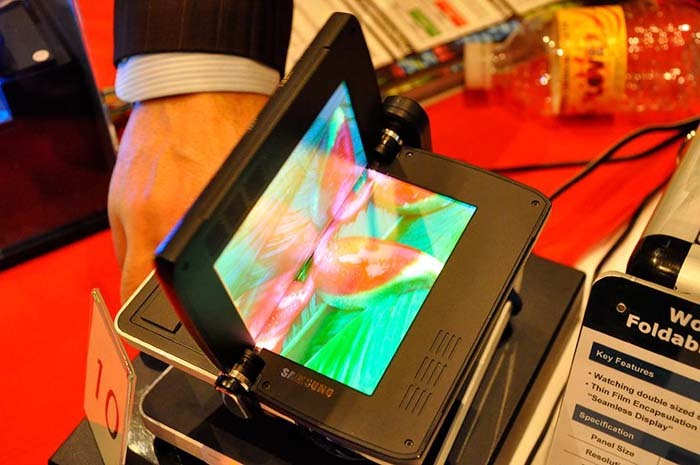 The image above was taken at CES in 2009 and showed off what Samsung then described as “The World’s First Foldable AMOLED”. The problem back then was that the technology was bulky and had a really poor resolution of just 480×272 and will have likely been incredibly expensive. But given the buzz around the iPhone X, Samsung’s X phone is almost guaranteed to make a global-sized splash. If this model number does indeed belong to the pocketable phone, we expect it to show up at the NRRA’s US equivalent, the FCC, for a filing. And as we’ve seen most recently with the Google Pixel 2, popping up there is a good sign that a release is near. Anyway It’s possible that Samsung will unveil the device at CES, but that show tends not to focus on mobile so much. It’s perhaps more likely that the phone will get launched at MWC in Barcelona instead.